As a spine surgeon, I take care of patients with conditions affecting the cervical, thoracic and lumbar spine including degenerative conditions as well as adult and pediatric advanced deformity, which is my area of interest. My patient care philosophy is to treat each patient as I would treat a member of my own family. In circumstances where surgery is needed, it’s already a very difficult and tense time for people. I pride myself in treating each patient as an individual. What might work for one patient might not work for everyone, so part of my job is to develop a treatment plan that’s specific to each person’s condition. That might include non-operative care or possibly surgery. I believe that by combining the tenants of research, teaching and education to provide excellent patient care, I’m living Ohio State’s mission to provide personalized medicine for everyone. I grew up in Pakistan and came to this country in 1998. Since then, I’ve been involved in medical research, teaching and education. My wife is a clinical psychologist from California and we have two boys. In my free time, I love to cook and I fancy myself an amateur chef. Back in the day I used to play bass guitar in a band. Hopefully there are no pictures available! Dr. Kahn is very informative and patient. 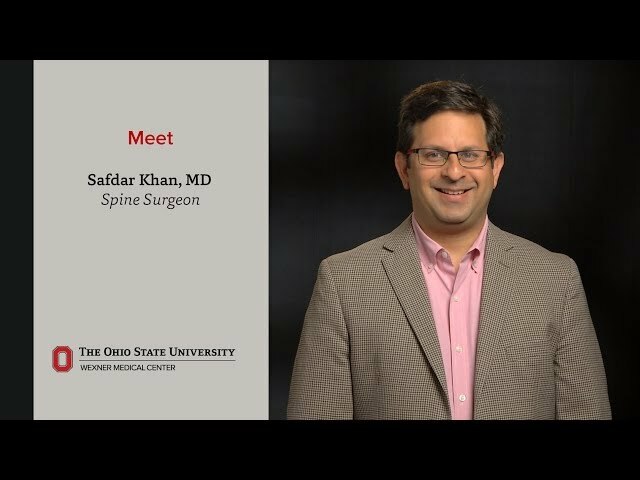 OSU & Dr. Khan are excellent. Love Dr. Kahn. He listens..understands and does everything to try to help. Very down to earth. Makes you feel heard and taken care of. Dr. Khan is very concerned about my problem, and very good at explaining the situation. He takes all the time I need, and is very friendly. Makes me feel like I am his only patient. As of 12/20/2018, Dr. Khan has reported no relationships with companies or entities.